She wants the city, or at least a well-served village within a short walk. He loves the country home designed by Incite in 2001 and the surrounding woods. The motivation to downsize now that the kids are out of the house got them looking around for alternatives. 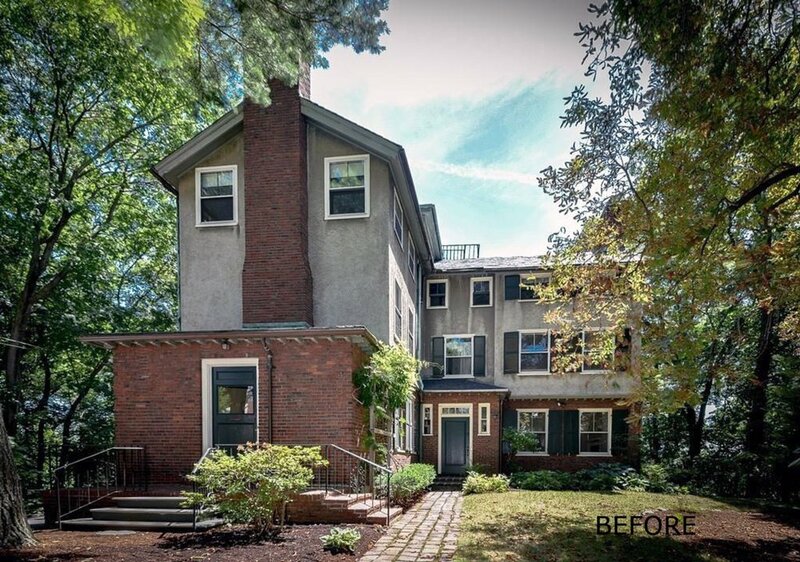 They stumbled onto an interesting prospect; a three-story 1907 eclectic home on a cul-de-sac walking distance to Waban Village. The unusually large .9 acre parcel slopes down at the sides and rear of the property offering dynamic views through and over handsomely husbanded woods to the east, south and west. At 4,000 s.f. it is not much of a down-size from the current home they are leaving in the suburbs but the balance of urban and rural aspects of this property's location is a remarkable fit for the client's dreams. Then there's the home itself and Incite's challenge. The home has very solid bones but also some flaws that we are the process of designing fixes for. Even though the home has plenty of living space, the fixes we are proposing require modest additions, balanced with a little demolition, to allow it to actualize its full potential for a modern family. The goals of the proposed additions + renovations are to add a 2-car garage (there is none now), enhance the home’s curb appeal and remodel the interior spaces to create a more open floor plan. Currently the informal service entry is located awkwardly at the very front of the home in a one-story add-on that, in my opinion, is not part of the original home. We propose to remove it and create a wrap-around porch which will allow visual, and encourage physical, access to the formal front entry at the right side of the front wing. The front entry and foyer are basically remaining as is but are now to be contained in the proposed Front Hall addition which is an extension of the new porch roof line form. The proposed garage is positioned to the right of the home, where the ground is relatively level, which also helps to weight the entry sequence to the right of the front wing. Driveway modifications keep vehicles and persons away from the precipitous left side retaining walls and severe drop off. The garage is connected to the home through the Front Hall and the displaced informal entry and mud room are located here. No additions are being proposed for the 2nd or 3rd floors except for a future suite over the garage. At the 3rd floor we propose to lower the height of an ill-proportioned tower and change its roof structure from flat to a hip roof to enhance its appearance. The brick façade around the 1st floor is to be retained and restored as are the 3 elegant chimneys. The stucco around the 2nd and 3rd floors is to be replaced with cedar shingles. A screen porch is proposed to replace a covered patio at the back with an adjacent open deck overlooking the dramatic views.